In June, Tony Hagelgans '87 and Tim Gresla '88 were key members of a crew that raced, and returned, the 39 foot sailboat (Pearson) "Shindig" between Bermuda to Newport, Rhode Island. The boat is owned by a mutual friend. Brother Gresla was on the six-person race crew which finished 8th in their class in the 2010 Newport-Bermuda Race (www.bermudarace.com). He sailed the journey of over 635 nautical miles in about 82 hours and 25 minutes. Brother Hagelgans joined the four person crew for the return sail from Newport back to Bermuda. While taking his turn at the helm of the boat, he encountered extremely rough seas sailing through the Gulf Stream in a storm. During the heavy weather, a rogue smashed the vessel and caused the centerboard to break off, but the boat was still able to make it back to port. Having no fear, our seaworthy Phis are looking forward to racing together in 2012. Martin Newcomer, III '38 celebrated his 97th birthday on March 29 with his wife at his residence in Cranberry Township, Pennsylvania. Brother Newcomer activated in Michigan Alpha on May 7, 1932. He is among the oldest known living members of Michigan Alpha, and still keeps in contact with the chapter. In recognition of his 78 years of loyalty, and congratulations for his milestone in longevity, the active chapter sent him a birthday card signed by nearly 30 active brothers with their Bond Numbers. The highest Bond Number signed on the card is 1953. Brother Newcomers' Bond Number is 440. 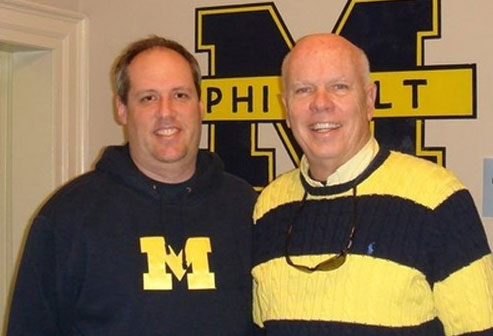 His daughter, who lives in Ann Arbor, contacted the active chapter to inquire about the possibility of the fraternity helping her father to celebrate his birthday by signing a birthday card. The active chapter members were thrilled to demonstrate why Phi Delta Theta is considered a fraternity for life. Patrick Moore '08 graduated from the U.S. Air Force Pararescue selection course in the spring. From a starting class size of 122, he was one of sixteen who managed to graduate from the Indoctrination course.